The Slow Food concept is a simple one – everyone should have access to, and enjoy, food that is good for them, good for those who grow it and good for the planet. 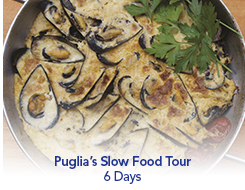 On this Slow Food tour of Puglia, you will have the unique chance to sample several Slow Food Presidia products – high-quality, traditional foods at the risk of “extinction” – and other local delicacies from recommended quality producers. Alongside tasting wonderful produce you will also discover a region of overwhelming beauty and history, filled with magnificent caves, imposing castles, ancient cathedrals and noble palaces. Our journey begins with a walking tour of Bari to admire the Norman Swabian Castle, an extensive and formidable structure that guarded the city for centuries, the Basilica of Saint Nicholas and the cathedral. After some free time to explore Piazza Mercantile and Piazza Ferrarese, we continue to Gioia del Colle for wine tasting at Tenuta Patruno Perniola. The principle aim of the farm is to preserve the Primitivo di Gioia del Colle local vine, whose origins date back to the Peucetii times. After checking into our hotel in Martina France, we drive to Ristorante la Tana for a welcome dinner. Dedicated to the Slow Food Presidia of Apulia, this is a fantastic introduction to the authentic cuisine of the region. This morning visit the wonderful Castellana Caves. Situated at a depth of approximately 70 meters, these caves are some of the most amazing natural wonders of Puglia. In Alberobello we see many examples of the prehistoric dry stone dwellings known as “trulli,” an exceptional example of vernacular architecture. At Trattoria La Cantina we enjoy a traditional Murgia cuisine lunch, accompanied by local wines before returning to Martina Franca for a leisurely stroll around the beautiful historical town center. Today we travel to Cisternino, one of the most beautiful villages in Italy. We visit the Old Town centre and enjoy lunch at the Tavernadella Torre. Here the delights of Capocollo, a traditional Italian cold cut of pork, and wines from the Puglia region will be served. After a visit to the white village of Ostuni we stop at the splendid Masseria Ferri to try some of their cheeses, including Mozzarella, Caciocavallo and Tarallini. Our journey continues to Gallipoli, where we enjoy an evening at leisure. Morning departure for Otranto, a pretty harbor town overlooking the turquoise Adriatic coast. After some free time to stroll around the town to inspect the Old City with its famous cathedral, we continue to Castro Marina to visit the Zinzulusa Caves, one of the most renowned cave systems on the Salento coast. Later we explore the vineyards and taste wines from the Azienda Castel di Salve winery, which focuses on growing indigenous grapes such as Negroamaro, Primitivo, Malvasia Nera di Lecce and Aleatico. After exploring Gallipoli, with its splendid and characteristic historical town center, we visit Frantoio Ipogeo, an ancient underground olive mill carved from the stone that lay beneath the soil in the 1700s. Later enjoy a guided walking tour of the ancient town of Lecce, known the “Baroque Pearl” for the unique, rich and exuberant decorations that seem to hide the city’s buildings rather than decorate them. Along the way we stop to try the breads, pizzas and the famous Pucce Leccesi (a traditional bread with olives, tomatoes and other vegetables). Tonight we enjoy a farewell dinner at Osteriadegli Spiriti, one of the most typical regional restaurants of the area, before returning to Gallipoli. Our first stop today is in Matera, known as the “City of Stones.” This city is the most extraordinary and intact example of a troglodyte settlement in the Mediterranean region. The oldest sassi (ancient homes carved right into the rock) are about 7,000 years old. After a light lunch at Azienda Dragone winery, we return to Bari where the tour ends. Visit the SITA World Tours website for further information. You are currently browsing the Puglia Connection Blog blog archives for February, 2015.